Pensacola Beach is the perfect setting for your next story to come to life. Whether on a family holiday or a romantic getaway, there are many stories to be made. Here are a few ideas for some great stories with happy beginnings, middles and endings. without the crowds or summer price tags. The Gulf and the Sound — Pensacola Beach loves to show off its spectacular views, especially over a great meal as the sun melts below the horizon. There’s no better time than the fall to enjoy a sunset dinner, when the breeze coming over the water has cooled down significantly and the crowds have dwindled. No matter what your aquatic preference, there are numerous fantastic dining experiences along Pensacola Beach where locals and visitors alike are able to enjoy the sparkling, emerald H2O up close. Visit these scenic destinations during your stay, and get ready to be greeted by stunning vistas. Forget the sweating and the potential sunburns you might get during the summer fishing season. Instead, the fall brings more comfortable fishing conditions with the chance to catch some of the same summer species as well as fall favorites. Leading into October, you can still catch some of the best grouper, amberjack, triggerfish, wahoo, marlin, and tuna, as well as red snapper when the season reopens for a short period. King mackerel is a good catch in the early fall, and the big redfish appear in November when the water cools down. 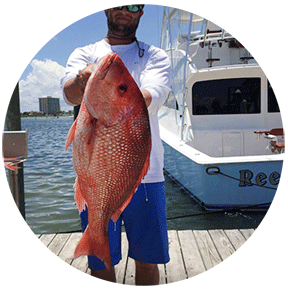 Charter captains and boats in Pensacola Beach and Perdido Key are abundant, passionate and knowledgeable on the hottest fall fishing holes. 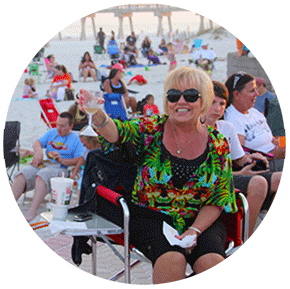 Cooler nights invite you to take advantage of the free outdoor entertainment on Pensacola Beach and downtown. Pensacola Beach’s outdoor concert series, Bands on the Beach, continues weekly until the end of October and attracts hundreds who want to sip and sway under the starry beach skies. A well-diversified line up of local and regional artists take the stage at the beautiful Gulfside Pavilion on Pensacola Beach each week at 7 p.m. The event attracts thousands of fans throughout the season. Folks of all ages set up their lawn chairs, blankets, and picnic baskets. Heck, some folks go all out with tables and fully prepped meals while enjoying the music. For those less prepared, concessions and cocktails are available nearby. Whatever your style, the venue’s beach backdrop, accompanied by a subtle island breeze, is hands down unparalleled. Fall is the perfect time to enjoy the emerald green waters of the Gulf of Mexico when space is ample. Explore the award-winning, pristine sands, watch for migrating birds, and learn about the flora and fauna while traveling along the hiking trails within the Gulf Islands National Seashore. Or, if you prefer by water, discover the seashore by kayak while paralleling the island on the Santa Rosa Sound, a paddlers’ paradise where kayakers and canoeists enjoy the gorgeous views when it’s not so warm. Free, public stargazing sessions on Pensacola Beach continue in September and October and offer the chance to see the stars, planets and even galaxies through a dozen of powerful telescopes set up by the Escambia Amateur Astronomers’ Association. 5. We've got the Blues! 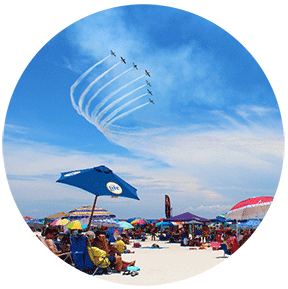 Pensacola may be known as the “The Cradle of Naval Aviation” and lucky to be home to the Blue Angels, the U.S. Navy’s elite flight demonstration squadron — but the last weekend of September brings a different kind of Blues to Pensacola Beach, one that music lovers won’t want to miss. 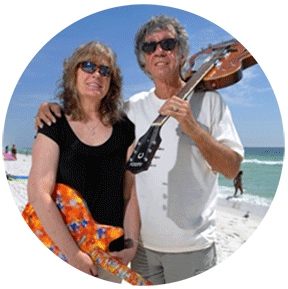 The Pensacola Beach Songwriters Festival runs September 29 through October 2 when many of the restaurants and bars on Pensacola Beach play host to more than 75 award-winning and up-and-coming musicians and songwriters who come to the beach for the weekend to perform their original songs and talk about the stories behind the music. Sign up for our e-newsletter to get late-breaking news on events and to receive special deals. Check out our visitors guide to plan the perfect Pensacola Beach getaway. Soak up the astonishing surroundings during a year-long lineup of events. Our fearless approach to having fun starts with the Polar Bear Plunge on New Years Day, and the momentum rolls on from there. Mardi Gras events soon follow and include a pet-and-kid parade a few days before the massive bead-slinging floats rumble down Via de Luna. Holiday events cap off the festive year beach-style with a Lighted Boat Parade and Surfing Santa Parade. 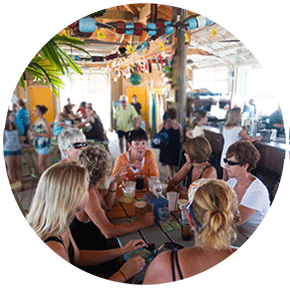 In between, visitors find plenty of events on Pensacola Beach to come out to eat, to dance and to join the festivities. The Blue Angels draw huge crowds to Pensacola Beach every July for the Pensacola Beach Air Show to see the U.S. Navy’s flight demonstration team perform thrilling maneuvers over the Gulf of Mexico. When the powerful F/A-18 Hornets zoom by in diamond formation, the spectacle literally rattles your cage. When the awesome aircrafts roll, spin and perform the “knife edge pass,” thousands of spectators collectively gasp. Several civilian airshow teams warm up the crowd with precision formation acrobatics that leave hearts racing. Find the perfect accommodations on the beach and set up early to avoid the event traffic and ensure the best views. Holiday weekends during the summer see our beaches fill to capacity, too. Join the crowd during Memorial Day, 4th of July and Labor Day for epic beach vacations. Or come any time of the year to enjoy the natural beauty of Pensacola Beach. The water might get a little chilly in the winter months, but the setting, food and people are just as sensational. 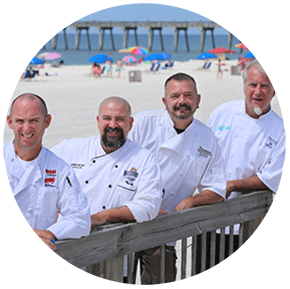 Any day of the year on Pensacola Beach, the fresh catch expertly prepared and served up at our restaurants is cause for celebration. Taste of the Beach (Sept. 15–16, 2017) puts it all on display. The spirit of creativity shines among all chefs who participate in the weekend of cooking demonstrations and savory samples. 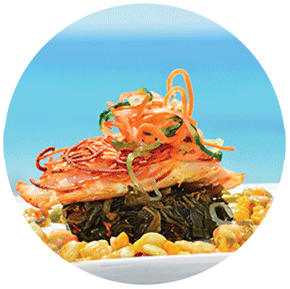 Guests get to graze on amazing signature dishes and fresh seafood for only $5 a pop! October’s Art & Wine Festival transforms the Pensacola Beach Boardwalk into an artisan village, with regional artists on site to sell their work. Spirited stops welcome participants to sample regional and national wines in a stunning waterfront setting. 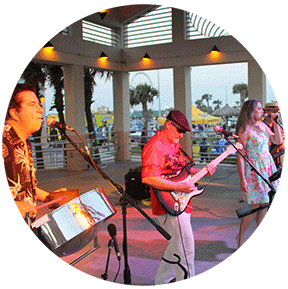 April through October, Bands on the Beach stages live concerts every Tuesday night at the Gulfside Pavilion on Casino Beach. Sink a lawn chair into the sand and enjoy Southern staples such as classic rock and country. Check the lineup to see which week oldies, tribute, jazz and party bands hit the beach. Who knows, Johnny Earthquake and the Moondogs might move to the top of your summer playlist. In October, Santa Rosa Island Triathlon challenges athletes with a 600-yard ocean swim, an 18-miles bike ride along the National Seashore and a 3.1-mile run through the scenic neighborhoods of Pensacola Beach. 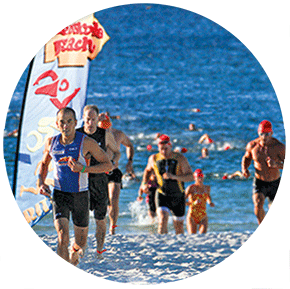 This “sprint triathlon” draws 1,250 competitors and their fans to the beach each year. Runners find opportunities year-round to add a great workout to their vacations. The long ribbon of bridge that spans the bay hosts seasonal bridge runs, and the white sands of Pensacola Beach see a steady stream of runners, as well. The Double Bridge Run in Spring stages a 15K for serious runners across Pensacola Bay and Santa Rosa Sound. Or you can opt for the 5K run/walk that crosses the bridge over the Santa Rosa Sound. Or take it easy by renting a bike and touring Santa Rosa Island at your own pace. Sign up for our e-newsletter to get late-breaking news on events and to receive special deals. Order a visitors guide to plan the perfect Pensacola Beach getaway. the children crave more excitement. There are camps for surfing and stand-up paddleboarding for ages 8 and up. At Quietwater Beach, you will find three outfitters sure to put you comfortably atop the water or soaring over it. 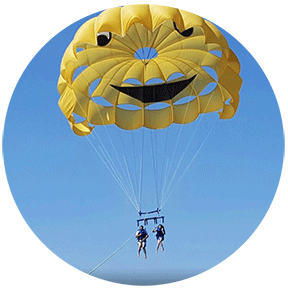 Key Sailing, Bonifay Water Sports and Radical Rides provide the ingredients for memorable experiences on parasails, Jet Skis, Wave Runners and other speedy watercraft. A few can rocket across the water at 70 m.p.h. Safety comes first, however, so lessons and flotation devices are mandatory. Find plenty of room to roam once you are on the water. Santa Rosa Sound leads to historic Fort Pickens, Naval Live Oaks Reservation, Big Sabine Bay and long stretches of secluded beach. Whatever your route, look for fish scooting under the water while pelicans, herons and other sea birds keep watch overhead. The water in Little Sabine Bay is usually calm and flat, making it a great place to try stand-up paddleboarding for the first time. Coastal Paddle Company across from at Margaritaville is one of many outfitters that offer rentals and lessons. Coastal Paddle Company recommends paddle boarding for an unusual way to see and hear nature. It’s a very different perspective than from a boat. Rentals on Little Sabine are also available at Innerlight surf Shop and at Aloha Wine & Liquor. Paddleboard rentals can also be found on Santa Rosa Sound at Key Sailing and from Outdoor gulf Coast at Red Fish Blue Fish. Innerlight Surf Shop has been in business for 40-plus years, so its staff knows plenty about surfing. Along with rentals and lessons for paddleboarding and surfing, it offers a popular surf camp in the summer. The minimum age is 8, but the shop reports having campers as old as 78. So learn how to hang 10 if surfing is on your bucket list. Pensacola Beach has two intriguing man-made snorkeling reefs, one in the gulf and one in the bay, both easily accessible from shore. The reefs, at Park East and Park West, attract plenty of eye-catching fish. The world’s largest artificial reef—dubbed “the great carrier reef”—is here. The USS Oriskany, a 911-foot aircraft carrier, is 24 miles from shore, in 200-plus feet of water. 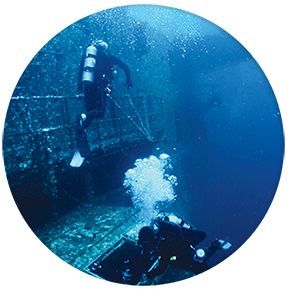 It’s one of five Pensacola sites on the Florida Panhandle Shipwreck Trail. All offer unique challenges and draw an amazing mix of fish and underwater vegetation. The others are YDT-14, a Navy dive tender in 100 feet of water; the San Pablo, a freighter that was sunk during World War II; Pete Tide II, a supply boat reefed in 1993; and Three Coal Barges, sunk in 1974. They and numerous other diving spots provide great exploring and an opportunity to swim with amazing sea life such as grouper, sea turtles, stingrays, triggerfish and maybe even a tuna. Pensacola Beach has mile after mile of public shoreline where you can wet a line, either in the gulf or along the bay. Bait shops will tell you what’s biting where. 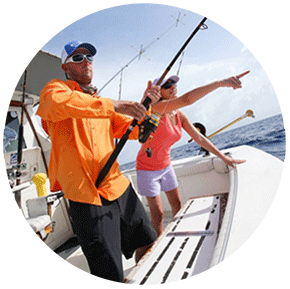 Serious sport fishers can choose a fishing charter and go out in the Gulf of Mexico for some legendary fish stories. The Pensacola Beach Fishing Pier is 1,471 feet long, making it one of the longest piers on the Gulf of Mexico. You don’t even have to be an angler to enjoy the pier. Many people take a stroll on it to savor sunrises, sunsets and all the activity. It’s a great draw for mackerel, cobia, pompano, flounder, mahi mahi and other fish in the area. It includes a bait shop, a restaurant and bar, not to mention savvy veterans who have been fishing off the pier for years. Before you set up your umbrella and chairs on Pensacola Beach, consider these essentials for optimal family trip success. Granted, the kids might not realize that they are playing on one of the most astonishing beaches on the planet. But that’s okay. Keep them distracted by the surf, the sand, the kites, the paddleboards and the dolphins. Then let the day unfold. Shops here know what it takes for family trip survival. Sunscreen, floppy hats and bottled water are a must. Then gear up for some proper family fun on the beach. It’s amazing how a tiny plastic shovel and pail translates into hours of fun for small kids. Coach them from under the umbrella as they try to keep the third floor of their sandcastle level. Hunting for seashells is another great way to keep the kids occupied. Bring a small net and watch their joy multiply as they pull tiny shells from the gentle surf. Most hotels and resorts on Pensacola Beach offer fun kids programs that give Mom and Dad some free time. From scavenger hunts and field trips with the High Tide Kids Club at Portofino Island Resort to dive-in movies and interactive pirate shows along the lazy river at Holiday Inn Resort, an engaged kid is a happy kid. Teens will likely want to venture out on their own to meet other teens. Area outfitters offer safe water excursions on people-powered and motorized vessels. Let them rent a kayak and set out on an adventure. 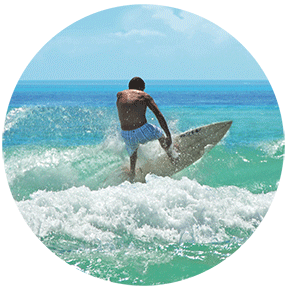 Several beach outfitters offer Surf Camp in the summer, the perfect way for your teen to do something cool with people their own age. Satisfy their need for speed with a spin around a go-cart track. They can also take a Jet Ski lesson and learn how to skim across the top of the bay or strap into a parasail for a thrill ride they will certainly text their friends about. For the more feet-on-the-ground types, inquisitive teens will find plenty to spark their imaginations on ranger-led tours of Gulf Islands National Seashore. 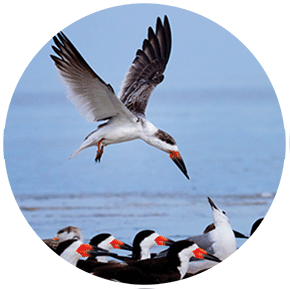 Tours pass through historic forts and habitats rich with native critters. Let’s review. Little kids: Keep them busy. Teenagers: Let them do their own thing. For the in-betweens, you need a deeper game plan. So be prepared to throw a little bit of everything at them. From the same place you got the plastic shovel and pail, pick up a kite and a football. Those will come in handy. Or let them loose on the Pensacola Beach Boardwalk to do their own shopping. The surf and t-shirt shops have all sorts of colorful souvenirs to draw them in. Sign them up at Coastal Paddle Company for a paddleboarding lesson on Little Sabine Bay. The calm waters and trained outfitters make this a safe and fun adventure. 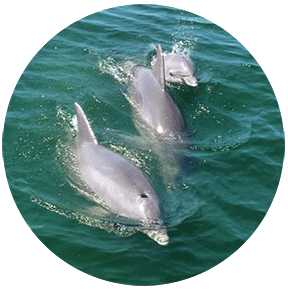 And a Dolphin Excursion, offered by area charters, is something your tweens will talk about well into their teens. If you have exhausted your options, keep this surefire hit in your back pocket: mini golf. You’ve all got to meet up when everyone gets hungry. Gather your group for some quality time at local eateries that keep family fun in mind. At Flounder’s Chowder House, tables overlook Flounder’s Beach on the bay, with beach volleyball and a playground to occupy the kids. Flounder’s is a favorite for birthday parties, and the kid’s menu features such crowd pleasers as Seven Seas Mac-n-Cheese and Blackbeard’s Chicken Planks. At Peg Leg Pete’s, also located on the bay, head to the lower level and set up at a picnic table next to the kids playground. You probably won’t get the kids to eat oysters, but it seems like every table here starts with a dozen fresh ones. Not to worry. Order Grouper Nuggets and Banana Dreamboat shakes for the little ones and then focus on the amazing grown-up seafood here. You know you are in the South when dinner starts with dessert. Friendly servers at Crab’s start the table off with Honey Buns to share: fried biscuits doused with sugar and cinnamon with honey on the side. Devour fresh crab legs and watch the kids giggle at you in a bib while they feast on chicken tenders and burgers. Try the region’s signature drink, the Bushwacker, and let the kids feel grown up with a slice of Bushwacker pie. Following the sweet theme, checks here come with a round of Blow Pops. However your family is made up, you’ll find plenty of activities to keep everyone engaged. 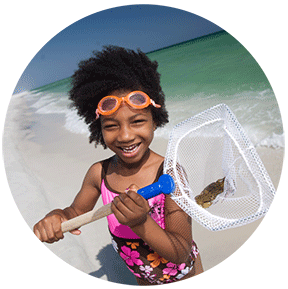 Find special deals and discounts to help plan the perfect family vacation to Pensacola Beach. With such an amazing natural backdrop, it’s no wonder travelers prefer to take it outside during their Pensacola Beach vacation. Read more about the Footprints in the Sand Eco Trail to see what other amazing natural wonders await.